Why good employees leave your organization? Home » Why good employees leave your organization? 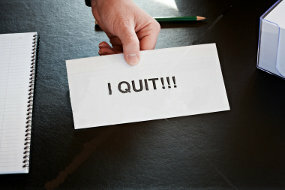 » Blog » Why good employees leave your organization? When talented employees continue to leave, it is alarming for most organizations. In this blog I would like to highlight the reasons and ways to arrest this growing challenge. Are we using the right processes to identify new hires? Do we know why our employees leave our company? Are managers given tools to identify talent and reward performance? Do they have the skills to use these tools? Do we have a system to develop potential? The problem could be any one or more of the following: Getting the right candidate for the right job: One important aspect of hiring is correctly defining job responsibilities of the new-hire. Do hiring managers give adequate details about the job requirements? Are line managers involved in the short-listing and interview process? Is the job description consistent and available to everyone involved in the hiring process? Without well-defined and transparent job descriptions that are easily accessible to all the stakeholders in the recruitment process, it may be difficult to identify the right candidates. Most attrition happens because we try to fit a round peg in a square hole. Offboarding: “No one utilizes my capability and capacity for work”, said one employee in an exit interview. Without a process to manage and address the concerns mentioned during exit interviews, organizations may miss opportunities to stem the flow..
HR Strategy: Most management teams are focused on increasing revenues and profits. While it is true that the primary aim of most organizations is financial growth, it is important to realize that this growth is not sustainable without a unified and integrated HR strategy in place. Tracking achievements: Employees are hired based on their past experiences and track record, and it is then assumed that they will do well in the new job. However, actual performance is the only true test of their capabilities. If you can’t assign goals and track achievements periodically, how will you differentiate between performers and non-performers – and reward them appropriately? Inability to do this effectively may frustrate talented employees and drive them to look elsewhere, where they are appreciated more. In such a scenario, how do you plan the growth of high potential employees? Our experience indicates that over a period of time employees who are not recognized adequately or have yet to reach their maximum potential, eventually quit. They perceive that their current organization cannot offer them the challenges, growth or recognition that matches with their career ambitions. In most cases, high performers leave because their aspirations for growth and recognition are not managed effectively. Helping you tackle these challenges is EmpXtrack, a comprehensive product that help identify talented employees, manage their career and growth and consequently, arrest attrition. For information on how we can help visit: www.empxtrack.com or click here to get in touch with us.